The bones of the landscape (the trees, shrubs, and perennials) are most tolerant of adverse growing conditions in fall and winter. The coming months are the best time of the year to put in new hardy material. Unlike the leaves, the roots of a plant will grow in winter; the energy a plant would use to produce leaves is transferred to the root system, and in the spring a healthier, more vigorous plant will emerge. How to handle and transplant new stock into your landscape is determined by several factors. How was the plant grown in the nursery? Ball & burlap? Container? Bare root? What are the plants drainage requirements? 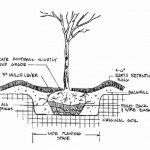 What type soil do you have and what is the draining characteristic? Have you had a soil test done? Should you take steps to aid in changing the soil’s pH? What’s the availability of water? Are you purchasing the plant for the site? Or are you changing the site to fit the plant? Ball and burlap (b&b in the trade) are field grown, dug, and root balls wrapped usually with burlap and shipped. B&B plants tend to lose a lot of their water absorbing root system when dug, and will require extra water and care for a long period after being transplanted. The biggest disadvantage of container grown plants may be over stimulated root development and may be root bound in the pot. Bare root plants are usually the most economical, but should never be purchased unless absolutely dormant and replanted immediately. When purchasing any plant material, protect the roots, stems, and foliage from wind in getting it home. Get them home in an enclosed vehicle or cover in transport with a tarp. 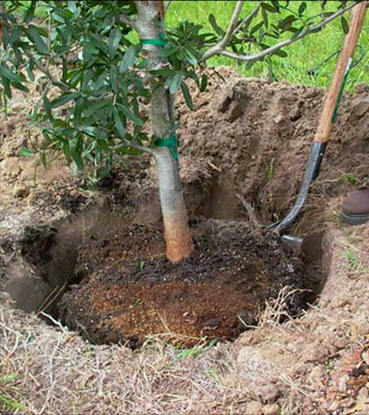 Move the plant around by its container or root ball to prohibit damage to the trunk. If you are not able to get it into the ground quickly, protect it from the sun and wind. Heel in your plant with soil or mulch if a freeze is likely. 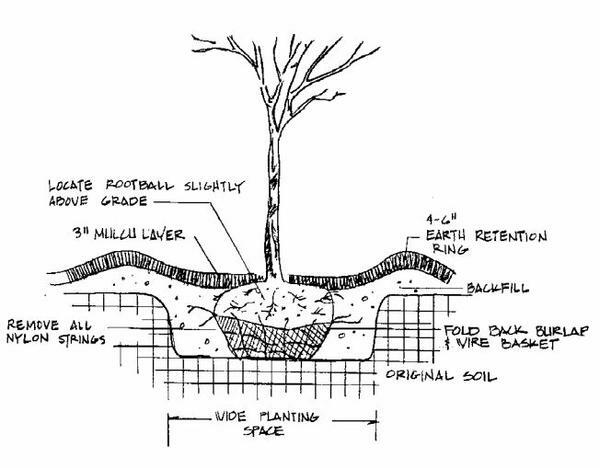 If you’re planting area has poor drainage, amend the soil, raise the bed, and/or shape the bed for better runoff. Poor drainage is a leading cause of plant failure. If your planting area is sandy and dry, amend the soil with organic matter that will improve the water holding capacity and mulch after planting. 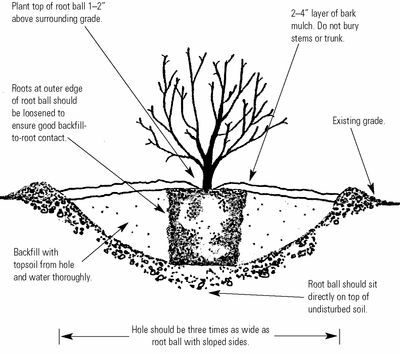 The planting hole should be dug 2 to 3 times the size of the root ball and no deeper than the root ball itself. 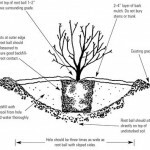 The root ball should sit on solid ground, not fill amendments. 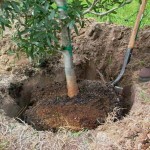 The original soil should be the supplemented with only 10-20% of added compost. What comes out should go back in. Watering a new transplant is the most important step, winter included. One inch a week is recommended.